Can't find another like it! Any insight appreciated! My grandfather left his coins to me when he passed and this,amongst other things, is what I found. I will be posting more when I get the opportunity. I've reviewed the coin under a microscope and there is no way the Image was filed, ground, sanded, etc.... . 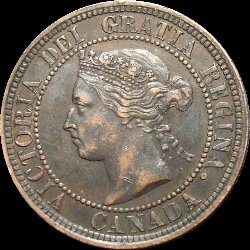 The letters in Canada and the date are untouched, another reason to believe the coin is unaltered. The coin thickness is also consistent with zero grooves, gouges or apparent damage to the coin as a result of alterations.I'm 100% confident is saying that although the coin has been in many pockets and taken a beating its definitely unique and original. Re: Can't find another like it! Any insight appreciated! i would check the weight and if that checks out then i think you have an interesting mint error mabe struck through grease? gidjit wrote: i would check the weight and if that checks out then i think you have an interesting mint error mabe struck through grease?